My first tale of luxurious London here: I have spent a few days there this week and I had spare "fun" money thanks to the extra exam board work this year, so I decided to have this facial. I read Jenny's excellent review of it a few years ago and was inspired. I've had a few facials in the past, most recently at the spa in the hotel I stayed at in Rome. That one used La Prairie products and was also very luxurious, but in general I find that the more luxurious the spa, the less confident I feel about being there. Bliss was not like that, for some reason, in spite of being very fancy. The receptionist was very welcoming, the robe was not too small, the towels felt extra-fluffy, there was complimentary lemon toffee popcorn and a variety of tea and my facialist was very friendly and put me completely at ease. Little things made a big difference, like there being a little set of steps to help me get into the bed, which was heated underneath while a fan blew over my face - a good combination. The facialist began with a cleanse and a few questions, since I had drawn a blank trying to explain what I wanted my facial to achieve on the questionnaire...better skin? Serenity and relaxation? Was it a trick question? Her: What do you cleanse with? Her: No, it can be quite drying. And what about when you haven't been wearing make up? There was a similar conversation in which I said my skin gets a bit sensitive in the sun and she managed to get me to point out that this might be because I don't wear a daily SPF. Clever. So, the facial commenced. What do you know? - I was the perfect candidate for an add-on! It was a collagen mask with light therapy. I already had an answer prepared for this occasion - "I'd rather spend the money on products" - but it must have been the lighting or something in the air because I went for it after all. It consisted of her laying what felt like plastic strips over my face with a cooling liquid underneath, leaving it to work for a while while she gave me a hand, arm and neck massage, and then shining light onto my face through it. I am not sure what the light did but the mask felt incredible. Then I think there was something warming applied to open up my pores and my face was wrapped briefly in a hot towel to get ready for the extractions. I've never had a facial with extractions before and they hurt a bit more than I was expecting, particularly around the nose, but the facialist was quite clever and did the nose a bit at a time. When she was working on the right side of my face it made me sneeze, which she explained was due to pressure on my sinuses. I wonder if that is why plucking my eyebrows makes me sneeze? I lost track of what happened after that: there were more products, hot towels and facial smoothings than I could count. A hair mask was applied with a scalp massage; there were several more things done to my face and there must have been another mask because she also found time to rub my feet. Almost the last thing was the application of pure vitamins with a blast of pure oxygen all over my face, which felt really wonderful in spite of sounding a bit jargony. I think I fell asleep at least twice during the process which I took to be a good sign, because I wasn't really tired so I must have been very relaxed. It all came to an end much too quickly. I couldn't believe that 100 minutes had passed (perhaps I was asleep for longer than I thought) but I had to admit that my skin looked incredible, particularly my poor abused nose, which looked as though it had been air brushed. She had had to go quite hard in some place during the extraction, which she explained was a lot to do with me not washing my face properly, and she had found me a rinse-off cleanser for my skin type which she'd left for me upstairs, along with a gentle rose exfoliator and a serum (I bought the first two but the serum was three figures and, although I had decided to push the boat out, I didn't want to sink it). In spite of all the extraction work, though, there was no redness. I did notice in the bathroom mirror after I had showered (Bliss products in the shower, of course) that the process had served to highlight tiny flaws in my skin that I can't normally see, but that can only be a good thing: it makes me want to take better care of my skin. The changing room was awesome. As well as the products there was a sauna (next time I will go early enough to take advantage of it, I think) and a great hair dryer and straightener; deodorant, body cream and scrub, combs, cotton wool, all that good stuff. Very impressive. I picked up a new shower gel upstairs when I went to pay for my treatment and chosen products, and when I walked out I felt like a million dollars, thus proving it to be a bargain. I'll definitely be back for another. Must start putting the pennies aside now. Cerys wanted a burgundy hat. She has red hair, so I had to make sure it was the right shade of burgundy. It's night time so these pictures are dire. This is Foliage again, with the Leaf and Vine pattern from the Stitchionary. I think I only have one more hat to do like this; the other girls want either two colours, and so will get plain stitches with stripes; or a strawberry hat. Looking forward to creating that one. I have technically already knitted one for Erin but I don't want to give her one that is the same as someone else's so I think I will reknit, maybe with another cable. That first Big Softie hat was a bit too small, anyway. Time for a bit of a hat, hiatus, though. This is number 13 of 21; 12 if I knit the first one again. 11 if I reknit Jason's, because I have been wearing the one I knitted for Jason, shame on me. However I slice it, though, I am over half way. 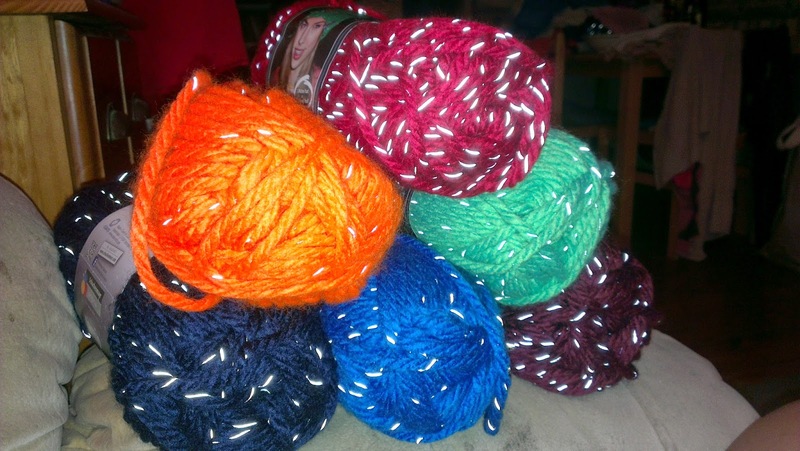 Now I want to get started on that Lopi jumper I have been planning for ages. I pulled the yarn out tonight and swatched; last year's Christmas jumper was essentially a muslin for this jumper so I should be able to get going quite quickly. The yarn (which I bought in Iceland in 2011) is hella scratchy. I hope it softens up with knitting. Combining two of my favourite things, ice cream and coffee, an affogato is one of my favourite treats. Pictured is one I had in Carluccio's whilst having lunch with Tutt last weekend. They allowed me to substitute bitter chocolate ice cream for vanilla which was very indulgent; however, I think it almost needs to vanilla because it adds that sweet hit to the whole shebang which is just so satisfying. I always find it a bit odd that I like affogato so much. I like my coffee strong, black and sugar-free, so the idea of eating it with creamy, sugary ice cream seems a bit counter-intuitive. It is really good, though. 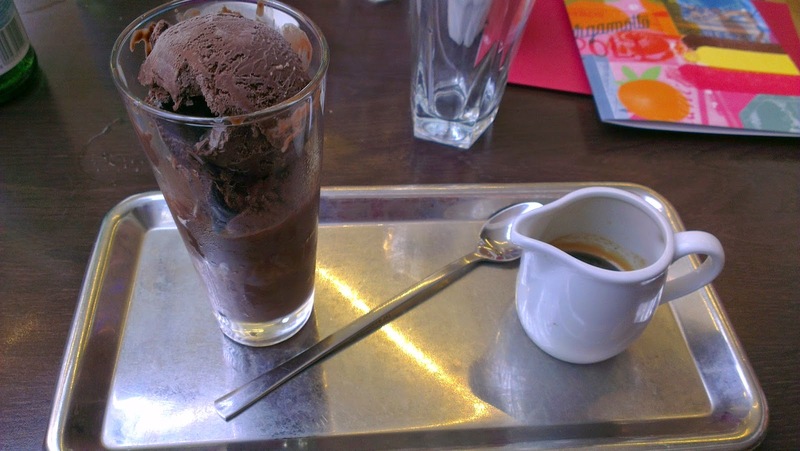 I tried to order an affogato in Italy, during our stay in Lecce, but either it's called something else there, or this is a faux Italian construct served solely in British Italian restaurants, or I wasn't saying it correctly, because I got a blank look. The woman brought me a sundae menu and there was some kind of gigantic ice cream that claimed to be an affogato, which I ordered. It wasn't the same as this, but it may have been the best ice cream I ate during my entire stay, in terms of texture. Dense and miraculously creamy. Mmmmmm. Wish I was back there today! You can tell it's the first day of the holidays - I've had a storming day. First, I castoff the Kayley. It is knitted in Cascade Pacific Chunky, which is a really nice wool blend - so soft and not squeaky at all. I used Foliage for the crown and then the Christmas Market lace pattern from the Vogue Stitchionary 5. It had issues, as explained on Monday, but I made it work. Then, I cast on for the Chloe Sm, in some dark purple Brown Sheep Lamb's Pride Bulky I've had in my stash since the last time I knitted a bunch of hats for my tutor group. This also began life as a Foliage, but this one has the Crystal Chandelier lace pattern from the Stitchionary. MUCH easier than the Kayley because this pattern is over 8 stitches so I didn't have to do any maths. I keep knitting hats I call the Rhys, but I think this one is actually it. Rhys has the biggest personality in my tutor group. He is an aspiring body builder who wants a career in fitness. I thought he could pull off the orange, but then when I went into Get Knitted at the weekend and saw they had stocked up on what must be the entire range of Schachenmayr Lumio colours (there were pastels....just, no) and this pink was sitting right at the top....well. The deal was done. This hat was bound off shortly after arriving home from aforementioned knitting group. Photo shoot took place on Friday but I am backdating my post. Anybody who can do maths will see that there is an issue for me reaching 127 posts before the end of the year. Expect some double-post-days coming up, as well as NaBloPoMo November. I know it looks finished, but don't be fooled - it's still a WIP. This is Kayley's hat. I knitted the start of the Foliage pattern and then added a lace pattern from the Stitchionary. This took several goes, because I was very tired on Saturday morning which got rid of all my sense. First I thought I had 96 stitches: I had 64. (In my defence, the worsted weight version of this hat is 96 stitches round so, yeah). Then, I decided that, since my lace pattern was over 14 stitches, I would INCREASE to 70 stitches. At no point did it occur to me that 6 extra stitches in bulky might make for a much larger hat. Then, there seemed to be an issue with the chart. It doesn't match the written instructions. The numbers didn't add up. I think I ripped back twice before I got it to work. So, then, all was going well. I toddled off to Malmesbury for the History festival and knitted through the first lecture I attended at the Abbey; not a whit did I care what people thought. I know I can knit and listen. The only reason it wasn't finished at the Abbey is because I left my 5.5mm tips in the car so I couldn't do the ribbing. I did that last night before bed. Then I tried it on. Big was not the word. It would have worked well if I had massive dreadlocks that needed to be swept up into it. I spent some time pulling it around and tried it on MrZ, but there was no getting away from the fact that it was just too roomy. It occurred to me that if I had decreased an extra 8 stitches I could have done the pattern for 4 repeats instead of 5 which would have matched the crown shaping better. So, yesterday, I, who never rip anything back, have taken it back to the crown and knitted the whole thing again. I am down to the ribbing. 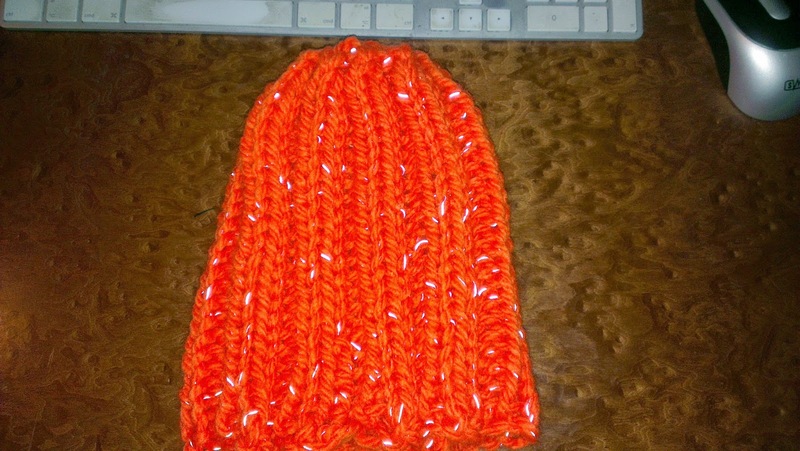 I like the chevron pattern and I think on a smaller hat it will show up even better; but I am annoyed with myself for not being a bit more thoughtful. I could have knitted a whole other hat by now! My friend Vikki at work has been baking periodically all term and selling her wares on a Friday breaktime, to raise funds for a child she is sponsoring in Burundi. Friday is a good day for cake in the staffroom because everyone's defences are low. This is the last week of the longest term, so I offered to bake something too, because defences will be SUPER low. 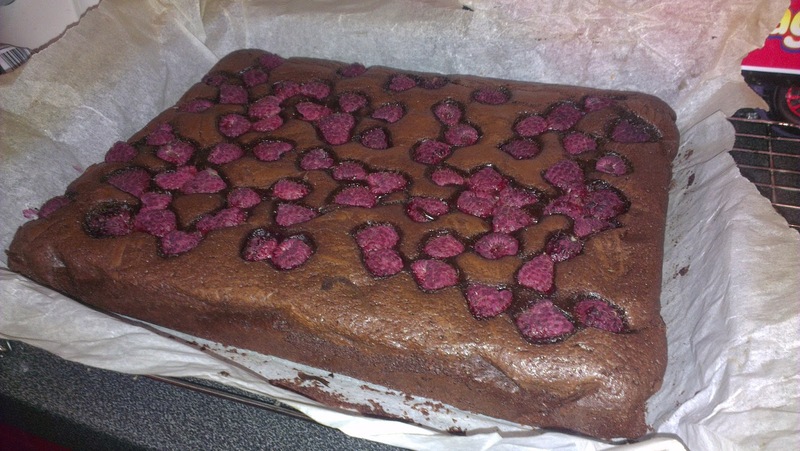 This is my favourite brownie recipe, by Lily Vanilli. It has chocolate and cocoa in it, so they are extra chocolatey. I added a layer of raspberries on top of the batter, expecting them to sink in, but as you can see, they did not. If I hadn't been in quite such a hurry to get them in the oven, I might have poured in half the batter, then sprinkled on the raspberries, then added the rest of the batter; I didn't want to stir them in, for fear of breaking them up. Unfortunately, I baked these for just a little too long, too. They lost their delightful brownie squidginess. Oh well, I will just have to make another batch soon. Ah, the humble gin and tonic. Drink of my youth. I remember reading in a fashion magazine interview with Kate Moss that her preferred drink was "Gin and tonic - it's delicious." Being a portly young lady I thought there might be something helpful in this, so it became my preferred choice too, when I wasn't necking pints of cider laced with vodka in an effort to get as drunk as possible on the least amount of spend. Time has passed and happily my terrible binge drinking habits have passed too (I don't drink vodka in any quantity now, since I figured out that it gives me the most awful memory loss which is at best disturbing) but I do still love a good G&T. Sometimes that first sip of one will take me right back to being 18 minus two years again, sitting in the pub opposite the Post Office having fetched the child benefit and taken my weekly allowance out of it. It's people like my youthful self that the Tories are trying to put a stop to, I fear. I keep a fair amount of gin in the house, never knowing when the mood might take me; my favourite is probably Hendricks. 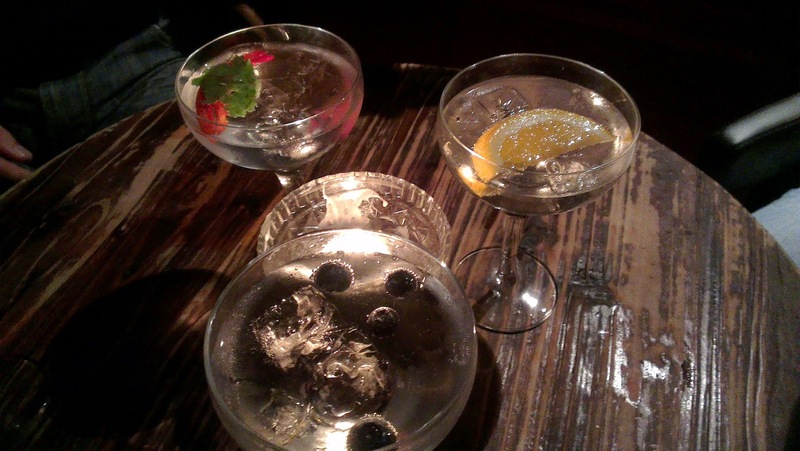 However, this picture was taken at the Canary Gin Bar in Bath, an establishment offering no fewer than 120 types of gin. It's a classy joint - the round above didn't leave much change from £30 - but over time, I reckon I might get through them all, and then I might have a new favourite. 1. If you don't want to sweat your make up off, go home. 2. If you don't want to do press-ups, go home. 3. If you want to talk at length with your friend about how you're definitely not getting back together with Jordan, go home. 4. If you've got the breath to talk, you're not working hard enough. 5. Right now, I wish I was Jordan. 6. If you don't want to use a mat that somebody else has dripped a bit of sweat onto, know that I will judge you a little because - surely you're going to chuck your clothes in the wash and yourself in the shower as soon as you get home anyway? 7. If you're worried about your bicycle crunches being pornographic, go home and change out of that pair of knickers and into some shorts. Srsly. That guy on the opposite side of the room can't stand up straight. 8. Actually, just go home and stay there. 9. Contrary to what you think, you can lift a 7kg weight off the ground. You're currently lifting two 4kg weights. It's not rocket science. 10. I hope that later when you're being all smug on Snapchat about working out, your nose grows, because what you have done today is not working out. I can't believe this one took me a whole week! It is testament to how busy I was. I think this one will be for Rhys - it needs a strong personality to pull it off. I took it with the flash on for added reflectiveness. This is hat number 9 complete; I have two or three more hats to make from the reflective stuff, which I will stripe; after that production may slow a little because I need to work on the lace hats for the girls. I have started one, pinching the instructions from Foliage for the crown; I'm going to add my own lace pattern for the body of the hat. 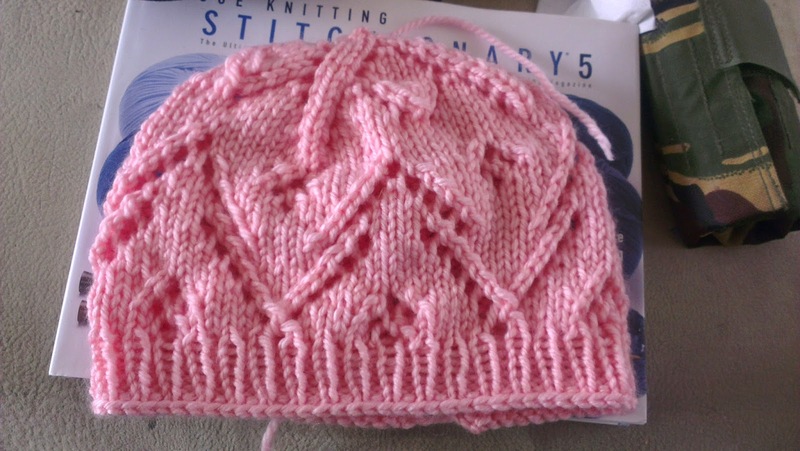 I just really like how these hats look top down - the edging at the bottom is so much neater. Not sick of hats yet, but ask me when I get to 15. I was hoping to knit another jumper before the end of the year but I'm not so sure now, especially since I'll be away for most of half term. I'm going on a course and having some pampering in the Smoke. I really feel like I've earned it. Only seven more teaching days to go! 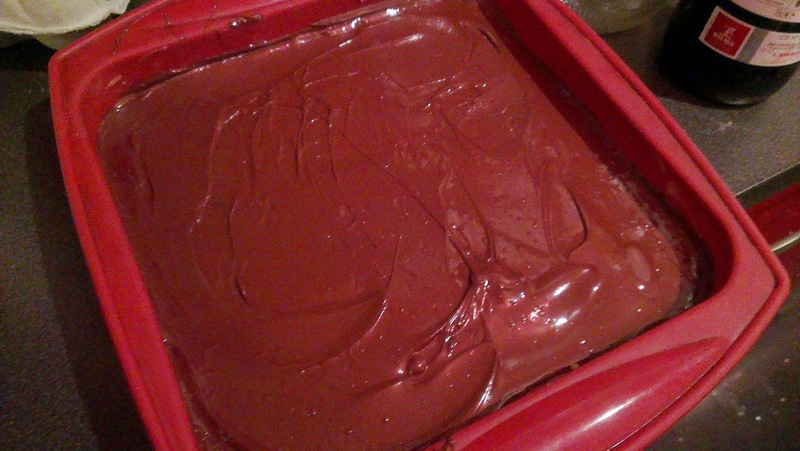 I know, it's a shocking picture and it doesn't look like much in the tin, but it's better than nothing, right? I've been making these for as long as I can remember. It's an old faithful recipe - it never fails, I always have the ingredients in*, and it always wows the public. There are no nuts or anything unusual that people might not take to, unless you count caramel which seems to not be everybody's cup of tea. I've tried a lot of millionaire's shortbread in my time but they are never as good (in my opinion) as this homemade kind - it's something about the caramel. The shop bought kind always seems to have a slightly unpleasant edge to it - like a chemical taste, or burnt sugar, or something. I can see why people might not like mine, if they are used to that; but it always gets a thumbs up. I got the recipe out of Mother Hand's Home & Freezer Digest and I feel it is burned indelibly into my memory. A 2/4/6 sugar/butter/flour mixture for the shortbread. Sugar, butter, condensed milk and treacle for the caramel. Lashings of dark chocolate. And - best of all - half a tin of condensed milk in the fridge, ready to do it all again later in the week. Sort of hoping now that they all use Wikipedia and I get to scoff the lot. * except today when I realised I had no chocolate and had to send Mr Z on a meryc dash in the rain. I have been exceptionally productive on the hat front since last Thursday, churning out four and a half (count 'em) Schachenmayr Lumio ribbed hats. This brings my total hat count up to almost nine, out of 21. I am quite pleased about this because it means I will probably have time to reknit the first one, which I think is a bit overly snug, and the fourth one, which I'd quite like to keep for myself. Although I bought another ball of that colour so I could make my own, it's rougher in texture than the first ball. Weird, since all the ball band info is the same. I've also started looking at lace patterns in my Stitchionary to try and come up with some variations on Foliage for the girls. Pictures of the Dan (navy) will have to wait. I meant to take the pictures yesterday but, naturally forgot. You're not having them now. I'm exhausted today: I fell asleep driving to work. It was a weird kind of tiredness, though - I went to bed earlier than normal yesterday; I felt more like I'd been drugged. I took an antihistamine right before bed last night so perhaps I bought the drowsy kind and it was still working 7 hours later. Anyway...bed for me now. I can't get to work and have a nap again tomorrow morning. It's assessment week! It was time, today, to break out the favourite cupcake recipe and get some ginger scents wafting around. My old head of department, who was promoted to Assistant Head and has consequently aged 10 years in the past month, has a thing for cakes with big chunks of ginger in them, and since I will finally be hosting a department meeting attended by all members of my department tomorrow, these seemed just the ticket. I haven't shared the recipe before because it is from a book; but having found it online I thought it probably couldn't hurt. It is from Dan Lepard's Short and Sweet, though the icing was all my own idea. Beat the sugar and 125g butter until smooth, then beat in the eggs one by one. Stir in the squash and chopped ginger, sift in the flour, baking powder and spices, add the nuts and stir until smooth. Line the pockets of a deep muffin tray with muffin papers, then fill each one almost to the top. Bake at 190C for 25 minutes, then set aside to cool. Meanwhile, beat the butter until fluffy, then beat in the icing sugar and enough milk to get it to a gooey consistency. Add about a third of a grated nutmeg (or more to taste - entirely up to you) and some syrup from a jar of ginger if you want a double-spiced flavour. Frost the cupcakes generously. Take to work and receive gratitude. After the success of the first hat I knitted in Schachenmayr Lumio, I decided the best course of action was to order more of it, especially since Shaw's up the 'wood told me they were not sure if they were going to be getting anymore in this year. In the end I decided to order it from Love Knitting who had a very good colour selection and were also able to offer me the rest of the yarn I wanted. Pretty cool, eh? The orange is particularly eye-watering. I've already managed to knit up four of these - they only take about an hour each. 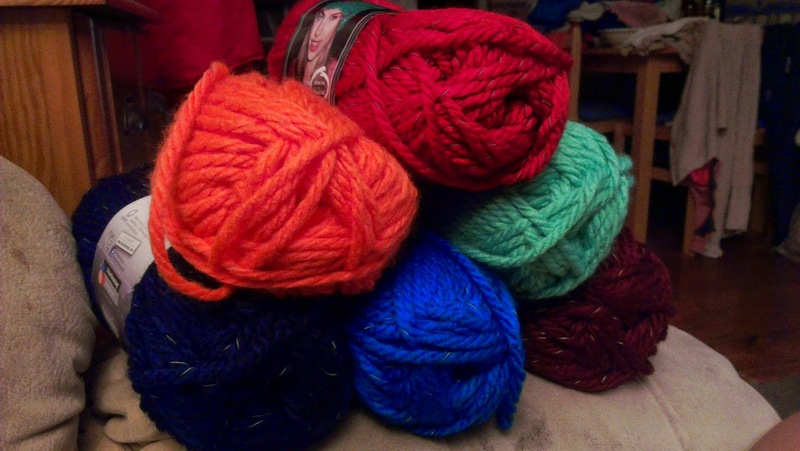 I also picked up some yarn for some of the girls' hats. Cascade 128 in a burgundy: I needed one that would really pop on a redhead (as I think I've mentioned) and although I was trying to avoid 100% wool for these, that colour was the best I could find. The pink is Cascade Pacific Chunky in candy floss. It's really soft and lovely. Finally, Big Softie for a girl who wants turquoise and light blue stripes. What's wrong with this picture?! The one on the left was pictured as much more turquoise on the website; I'm going to need to find something more turquoise with which to replace it. Oh, the humanity. An acquaintance from uni who is on my Facebook friends list asked this week for recommendations for the Great Ocean Road, and I instantly wanted to suggest the caravan park Beccy and I stayed at; but then I had a bit of trouble finding the name of it. I realised that I got too busy to blog about Australia in glorious detail, satisfying myself with a couple of quickie "Here's what I've been doing" posts and a more detailed account of my trip to Uluru. This is a tragedy! There were some amazing experiences that made up that trip. I did blog about our road trip a very little bit here, when it formed my very first "Today I wish I was..." post, but there are some even better pictures so I thought I would share them. As is my wont, I have done a little map of the places I remember staying/visiting. It currently just has the GOR places on it - the red pins. Having done a few road trips since then including the meticulously planned Italian adventure this summer, I am somewhat horrified to find no itinerary or calendar or detailed map of where we went and where. I started to wonder how I coped with that but perhaps I was a bit less of a control freak in 2011. 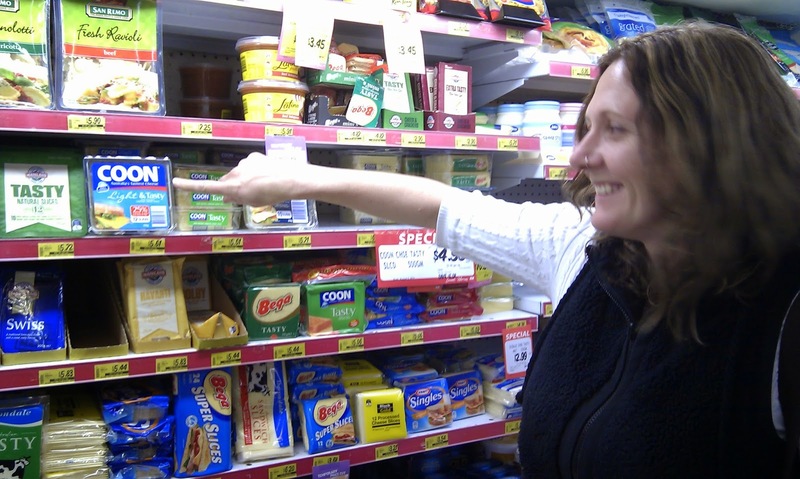 I was so lucky to have a few days to spend with Beccy. We hadn't spent anything like that amount of time together since we were at school: 4 days and 3 nights in a car, in a hotel room, or wandering a beach, and amazingly we didn't run out of things to talk about. I didn't tire of pointing out exotic-to-me roadkill and she didn't tire of giggling when I switched on the windscreen wipers instead of the indicator. The next morning we took a walk on the beach before going off to a local cafe for breakfast. The views were just amazing. The pictures are huge. Sorry, not sorry. Like some music has to be played loud, these just have to be viewed big. I know most people probably go to the GOR to see the Apostles and they are really spectacular (maybe a future blog post pending on those) but they were also busy and quite grand. We didn't find a way down to the beach when we got there. This beach was deserted; fresh from a night of being bashed by the waves; just for us. Later, when we were eating at Cafe Nautigals and taking a brief break from chattering to take advantage of the free wifi, we heard rumours that there were migrating whales in the bay. It was that lovely, I can see why they called in. It is a great water bottle. It holds a bit more than a pint (22floz). The lid doesn't get grotty or break, unlike plastic bottles I've had. It didn't form limescale inside, like my aluminium Google water bottle (which I lamentably left somewhere at the Festival of Education this year, much to my dismay). It kind of looks like polka dots, and it is glass, so it doesn't hold in flavours if I put squash or something in there. This should all have been written in the past tense, however, because today I was merrily swinging it on my way up to the staffroom, and, having not properly secured the lid, the bottle popped off the handle. Even though I have dropped this from a fair height on a stone floor before, the silicone sleeve prevented a breakage; but not twice. Two minutes late I was on my hands and knees with a dustpan and brush. Luckily they do sell them over here although they are about double the price they are in the US. I might wait until I go back there next summer.